About 3-4 years ago I was browsing some of the Amiga communities on G+ with our Guru Meditation account. I stumbled across a video of a bunch of Amiga guys throwing a great party – I mean a REALLY great party. I could tell from the video’s positive vibe that they were a bunch of cool, down to earth, fun, and passionate Amiga users. I thought to myself, wow, I want to go to a party like this! I started to do a little research and discovered that they are from Poland. This sparked my interest even more because my wife was born and raised in Poland and her family still lives there. I did a little more research and learned that the group that organized the party is the “Chełm Amiga Legion.” Chełm is a city on the far east of Poland and it is only one hour from Lublin, the city where my wife’s family is from. At this point I realized that there was actually a possibility that I could make it to one of their future parties. I commented on the video and got a positive and quick response from Tomasz “Jenot” Stafiński, one of the officers of the Chełm Amiga Legion, but Konrad “Kokos” Kostecki quickly jumped in and told me that Tomasz is really an Atari ST lover so I should be talking with him instead of Tomasz. I knew I found the right guys! Over the years I kept in touch with Kokos and the boys from Chełm and in the spring of 2016 I learned that AmiParty 19 would be taking place in August. My wife and I were due for a trip to visit her family so I figured August would be a great time so I could visit her family and hit AmiParty while I was there. When I suggested to my wife that we go visit her family, she knew something was up. It isn’t everyday someone is eager to fly across the globe to visit their mother-in-law! I explained the situation to her and she thought it was a great idea too so we bought our tickets to Poland and after several years of dreaming of going to AmiParty it became a reality. We planned our trip so AmiParty would be the last weekend of the vacation. In the 2 weeks leading up to the party I was “training my liver” by drinking all sorts of Polish vodkas because I knew it was going to be an Ami-PARTY and in Poland it isn’t a party without large quantities of vodka. AmiParty takes place over 3 days, Friday-Sunday. 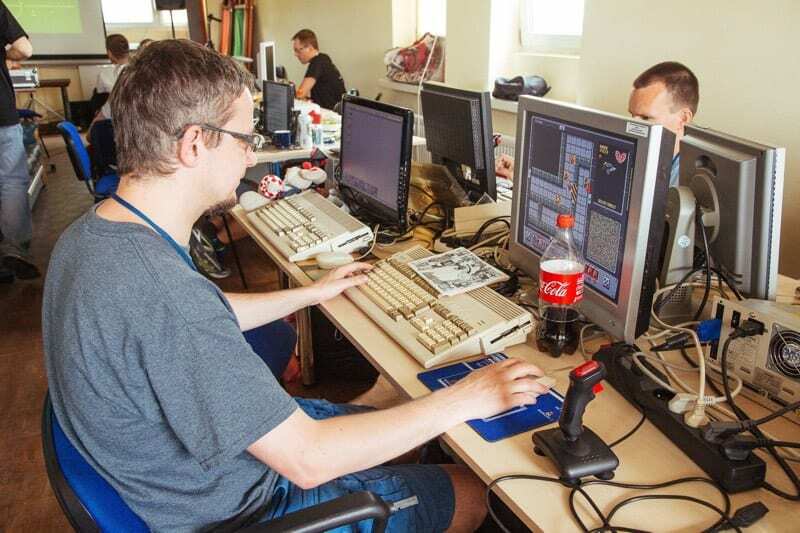 Friday is the setup and free form day; Saturday is the main day and has a schedule of events, which includes a Sensible Soccer tournament, DPaint graphics competition, and a MOD music competition. Sunday is the recovery, breakdown, and cleanup day. Early Friday afternoon I hopped into the car with my in-laws, a.k.a. “The Outlaws” and they drove me across the Polish countryside to the outskirts of Chełm where AmiParty takes place. It is an industrial area on the outskirts of a city near the border of Ukraine and my in-laws were thinking, “Where the heck are we taking this guy?? ?” Will we ever see him again? I was really excited but of course it was also a bit strange to be meeting these guys for the first time while being in a foreign country and not knowing the language. However, I had a great feeling about them and Amiga users across the globe are generally great people so I knew it would be fine even though it felt a little strange at that moment. On one end of the room there was a large projection screen that was connected to one of the host’s (The awesome “DJ Mario”) A1200, which was used to clearly display all of the things they were demonstrating. Because Friday night was free form, DJ Mario was showing all sorts of demoscene demos which were amazing and absolutely fantastic to see run on a real Amiga. 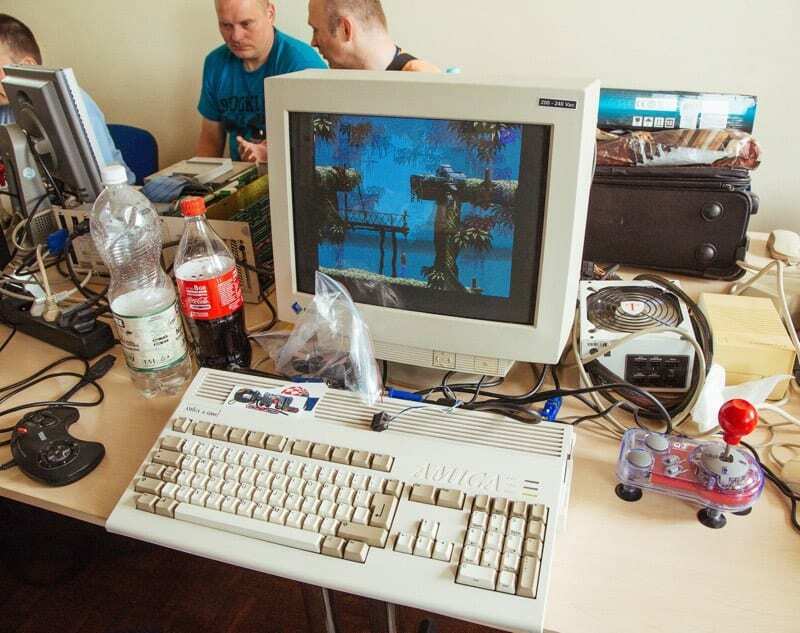 Most of them require an 060 machine, which I do not own, so I have only been able to watch them on YouTube but seeing them run on a real Amiga was a completely different experience. So not too long after meeting the gang, hanging out watching demos and having an absolutely fantastic time, the guys took me down to a kitchen in the building where they kept the “Bimber.” Bimber is homemade Polish vodka a.k.a. Polish moonshine! Bimber is not legal to make, so obviously none of the guys who attended the party made it, but it somehow found its way into the freezer at the party. I had a batch that was 91% alcohol and a batch that was 95% alcohol. Needless to say, that put an end to Friday night! Saturday was the big day. Even more people showed up. I entered the Sensible Soccer tournament which was organized by Tomasz and all around great guy Łukasz “Sir Lucas” Kucharuk who is one of the other Chełm Amiga legion officers. He is known as “the nicest guy in the world” and he certainly lives up to that! I haven’t played Sensi since the early 1990’s so I got wiped out in my first match and even scored a goal against my own tem! However, I actually improved with each match I played and made it fairly deep into the tournament. The tournament lasted throughout the day and in-between matches I hung out and talked with many of the attendees and even managed to shoot a couple of interviews with some very interesting guys for my YouTube Channel. 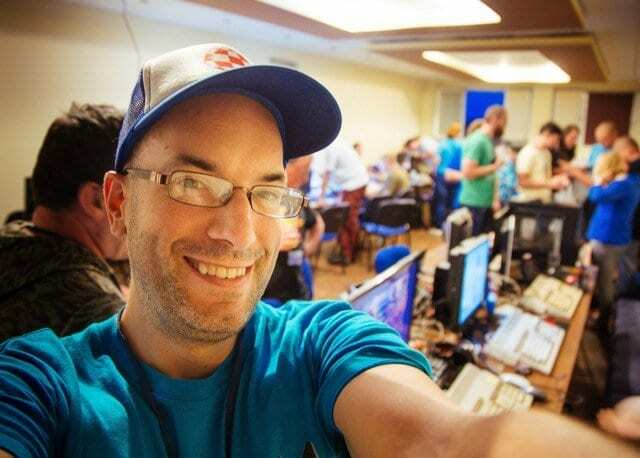 I interviewed Grzegorz “Krashan” Kraszewski, who was on the MorphOS development team as well as a custom hardware developer. Grzegorz “grxmrx” Murdzek who programs the “Polish Amiga Portal” which is the website that the Polish Amiga Users use to communicate with each other and organize parties. Grzegorz is also one of the organizers of Decrunch, which is a another party in Poland that is half demoscene/half retro meeting similar to AmiParty. I also interviewed another one of Decrunch’s organizers Marcin “GumBoy” Grąziowski. Unfortunately I didn’t get him on camera, but I had a wonderful conversation with Jacek “Deadman” Miśkiewicz. “Deadman” was explaining to me that even though the Amiga was very popular in Poland, it’s popularity peaked later than in most countries due to them being behind the Iron Curtain. When The Berlin Wall came down, guys would venture into Germany, pick Amigas out of the garbage, and bring them back to Poland. “Deadman” also explained that the Polish government actually promoted piracy in a way. There were government sponsored radio stations that would broadcast the audio tones for software over the air and people would record them onto cassette tape then load them into their machine. “Deadman” also had a briefcase of home brew instruction manuals for all sorts of Amiga software that were translated from English to Polish. Actually, many of them were not translations from the original manuals at all, instead they were written by people who played the game or knew how to use the program and wanted to share their knowledge with other people who acquired the game or software. It was a pleasure speaking with all these guys and their stories really opened my eyes to Amiga and computer culture in a place that was very foreign to me in the late 80’s and early 90’s. After the Sensi tournament concluded they had a DPaint graphics competition as well as a MOD competition. You can see all the entries and results here: https://demozoo.org/parties/2922/ The quality of work that was submitted to the competitions was top notch – absolutely beautiful. When the competitions were over, there were a few more presentations that were very informative, but obviously difficult for me to completely understand because they were in Polish. A very nice tradition that they have is when one of the MC’s and super cool dude Marcin “Stony” Iwaniak goes around with a microphone to all the guests and has a chat with them so everyone at the party knows what cool rig they brought or what they are doing with their Amiga at the moment. I was really blown away with how well the party was organized and even more impressed with the level of interest from all the attendees. All the attendees were extremely involved and participated in all the activities. The room was absolutely packed during the competitions and presentations. Everyone gave their full attention. It was impressive. The night concluded with lots of great music from DJ Mario as well as a healthy dose of Karaoke. By the time Sunday morning rolled around everyone was wiped out and simply packed up their systems, cleaned up, and said goodbye until the next party. photosource thegurumeditation | Amiga 4000 workshop! ?